This hose is designed for very high pressure waterblasting, hydro-demolition, or cleaning of pipes, ships, and tanks. We offer the rubber waterblast in several working pressures listed below; all types are resistant to weathering, oil, abrasion, and high heat. Standard lengths come with factory installed solid NPT ends (assembly part #'s are ie: NL745-050Xlgth). Swivel ends are not to be used as the o-ring can blow out. Only use components specifically rated for high pressure waterblast applications. 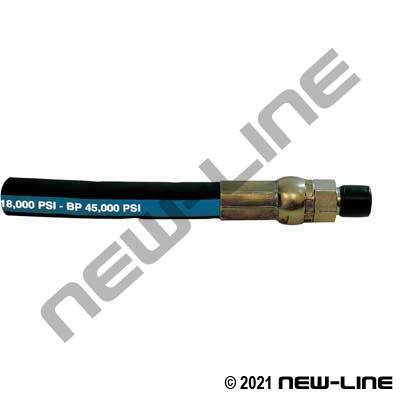 Typical Fittings: This is a CRITICAL PRESSURE HOSE, factory assemblies only. Factory attached SOLID male NPT crimp ends (do not use swivels as the o-ring can blow out), Eaton FD69 waterblast quick connects, Eaton FF90754 Guardian protective sleeve. Construction: Tube: Smooth, black synthetic rubber. Cover: Smooth, black synthetic rubber. Reinforcement: Multiple layers of wire. Detail Comments: Due to the critical nature of these hoses, always visually inspect for exposed/damaged reinforcement, rust, cracks, bubbles, or kinks before and after each use - such hoses are to be disposed of and replaced (not repaired). Dirty water, lack of draining, and improper suspension devices will shorten the life of this hose as well as exceeding the bend radius or crushing the wall. Notice: This hose used in dangerous applications. Do not repair.